In a move to forestall further violence and killings associated with farmers and herdsman crisis, the National Economic Council (NEC), a forum of Nigeria governors has banned open grazing in the country. The government also banned the free movement of cattles across the borders from other Economic Community of West Africa States (ECOWAS) member states. Addressing State House correspondents, after Thursday’s NEC meeting, Minister of Agriculture Chief Audu Ogbeh, who was joined by the Governor of Ebonyi David Umahi, Governor of Jigawa, Abubakar Badaru and the deputy governor of Lagos state, said the government can nolonger continue to allow the ECOWAS Protocol that permits free movement of goods and services in respect of cattles at the detriment of its citizenry. Ogbeh said that before animals would be allowed to cross the nation’s borders from the sub-region, they must be certified stressing that henceforth no cattle or herdsman would be allowed to cross on foot into Nigeria. “It was agreed that we should not allow foreign herdsmen enter our country without certification. 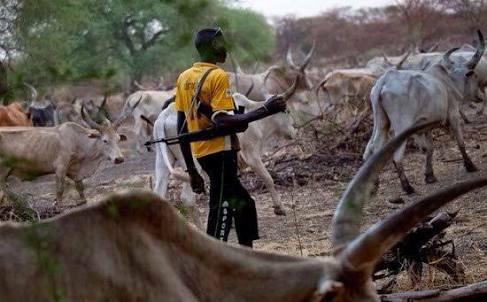 If they must come, they must come through proper certification,” stressing that the time of indiscriminate movement of animals and herdsmen across the borders is gone. We have asked ECOWAS members to control cattles,” he said. Ogbeh lamented that though Nigeria cannot stop anybody within the region under the ECOWAS protocol from free movement worrisome reports from the states where farmers and herdsmen clashed are prevalent showed a semblance of foreign presence and warned that Nigeria would no longer tolerate such. Speaking on the report of the technical committee on the farmers and herdsmen, chairman of the committee, Umahi said that NEC approved the immediate halting of movement of herdsmen and their cattle from one place to the other as part of solution to the incessant killings and destruction of property in the affected states. He said “movement by nomadic herdsmen has to stop. The most profitable way is ranching. That’s the way forward,” disclosing that the government has approved five states of Benue, Taraba, Plateau, Nasarawa, and Zamfara for the take off for grazing reserves. The governor disclosed that the respective states have agreed to provide lands for grazing reserves as permanent solution to the farmer and herdsmen crisis in the country. He also revealed that as part of an improved animal husbandry, the technical committee recommended the introduction of improved species of cows for high yield as well as the introduction of subsidies for animal husbandry, in the country. Umahi stated further that NEC also approved the report of the committee for the establishment of nomadic schools for children of herdsmen.